1. Preheat the grill to high, about 250˚C. Cover the red onion with boiling water for 15 seconds; drain well, then mix with the maple syrup, juice of 2 limes and a pinch of salt. Cover and chill. 2. Season the chicken thighs and mix with the chipotle paste, barbecue sauce, zest and juice of 2 limes, ½ tbsp vegetable oil and the coriander stalks. Lay on a foil-lined baking tray and grill for 5-7 minutes on each side, until charred and cooked through. 3. Meanwhile, heat the remaining 2 tbsp oil in a small pan. Fry the tortilla pieces in batches over a medium heat for 20-30 seconds on each side, until crisp; drain on kitchen paper. 4. 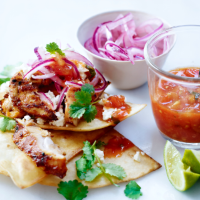 Slice the chicken and divide between the tortilla pieces. Top each with a little feta, the pickled red onion and a few coriander leaves. Serve with the lime wedges and a spoonful of salsa, if liked.